Ida B. Wells was an African American woman who achieved national and international fame as a journalist, public speaker, and community activist at the turn of the twentieth century. In this new edition Jacqueline Jones Royster sheds light on the specific events, such as the yellow fever epidemic, that spurred Wells’s progression towards activism. Wells’s role as a public figure is further explored in the newly included excerpt from Wells’s autobiography, Crusade for Justice, which focuses on a crucial moment in her campaign, her first British tour, when Wells gained leverage in pushing lynching to a higher level of attention nationally and internationally. 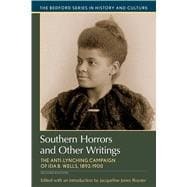 As Wells’s writings continue to play a key role in understanding both complex race relations and peace and justice as global concepts, Southern Horrors: Lynch Law in All Its Phases and A Red Record have been retained in the second edition. Features such as a chronology, questions for consideration, a bibliography, and an index are also included to aid students’ understanding of the historical context and significance of Ida B. Wells’s work. Jacqueline Jones Royster is Dean of the Ivan Allen College of Liberal Arts and Professor in the School of Literature, Communication, and Culture at the Georgia Institute of Technology in Atlanta. Among her areas of interest are the rhetorical history of women of African descent and the development of literacy. She has published articles in books and journals on literacy studies and women's studies. She is currently at work on Traces of a Stream: Literacy and Social Change Among African American Women.